It’s easy to see why this fun, modern, indoor wedding is one of our favorites! The day started with getting ready confetti and a giant indoor swing at The Hi Lo ... how much more fun can you get?! 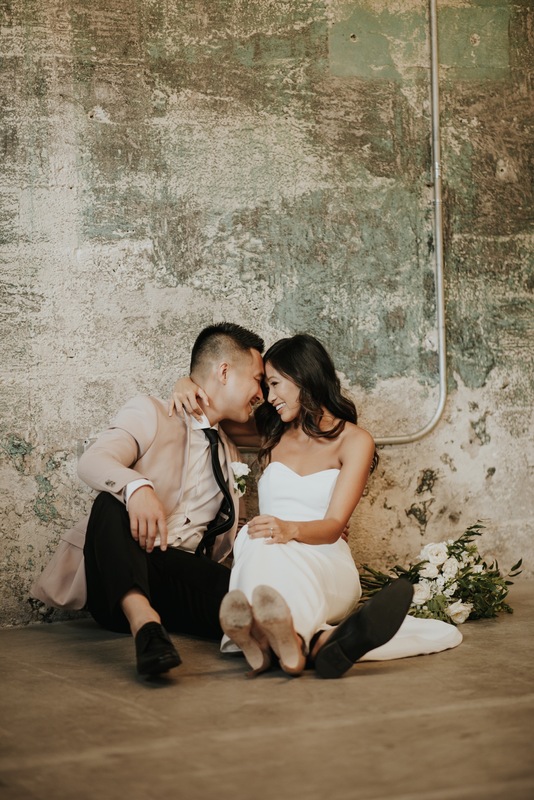 Well, after a beautiful church ceremony, the couple switched up their outfits and headed to their reception at Left Bank Annex, which we think was the perfect venue for this event. The venue’s minimal, industrial style allowed us to really transform the space to be exactly what the couple envisioned; while also accommodating some fun, unique aspects like the Pips Mobile donut truck and Smirk Photobooth! For the design, the couple wanted modern & white! We commissioned Good Seed Floral to create organic, white arrangements for the head table and trailing greenery garlands for the others. The modern, acrylic signage and table numbers beautifully complimented the simple hurricane candles that lined the tables. For a little pop of color amongst the white, we opted for a vintage looking pink coupe class, paired with a classic wine and water glass. As we’ve said before, statement glassware is the easiest & most budget friendly way to add to your overall design! This modern, white wedding was so stunning and a perfect representation of the newlyweds. Plus any night that ends with dancing and donuts is a win in our book! We’d love to make all of your wedding day dreams come true! Click here to learn more about our wedding design and styling services!